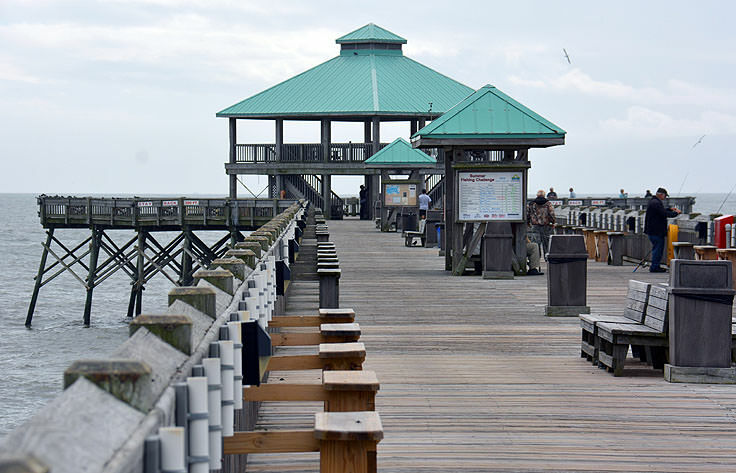 Fishing, incredible views, and romantic strolls overlooking the "Edge of America" are all on the agenda at the Folly Beach Fishing Pier, officially known as the more long-winded moniker the "Edwin S. Taylor Folly Beach Fishing Pier." 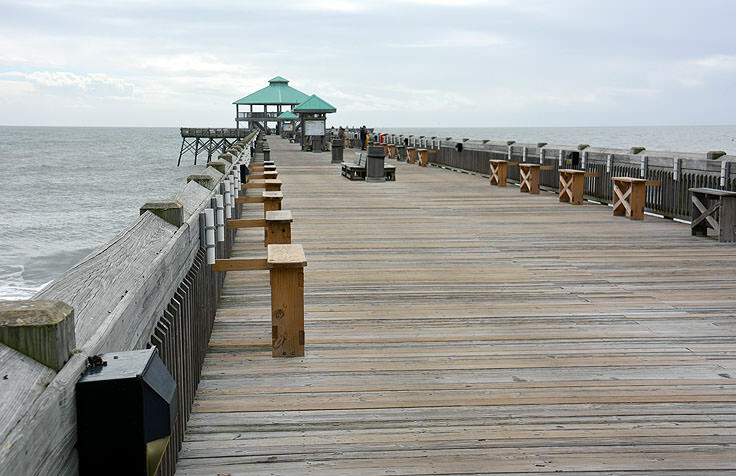 A whopping 1,045' long, and 25' feet wide, the pier is the second longest on the East Coast and is easily one of Folly Island's most esteemed, and most visited, local attractions. Fishermen love heading out to the structure for some of the best saltwater-fishing vantage points the South Carolina coastline has to offer, but a visitors doesn't necessarily have to have a rod and reel in hand to enjoy the site in its entirety. 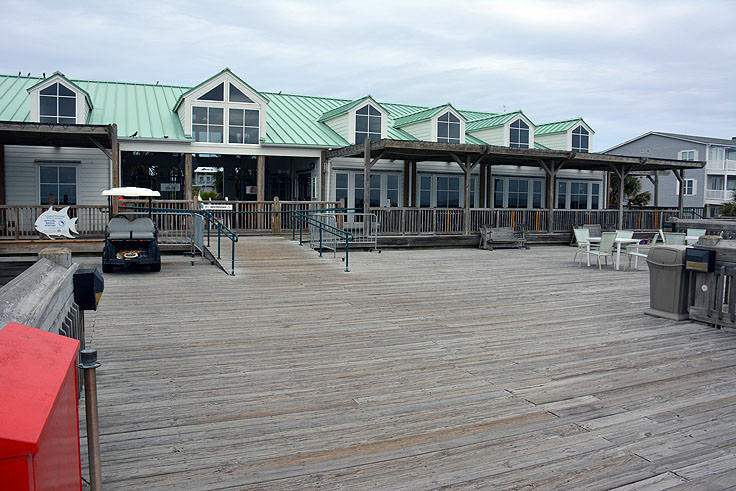 With a full-service restaurant, a gift shop and tackle shop, beach access with showers, and some of the most gorgeous vistas on the coast, virtually every seashore lover will find a reason to visit and lazily dwindle along this notable and acclaimed local pier. The ancient pier itself, a long wooden structure that hovers 23' feet above sea level and is supported by rows of longstanding wooden pilings, has seen its fair share of challenges. 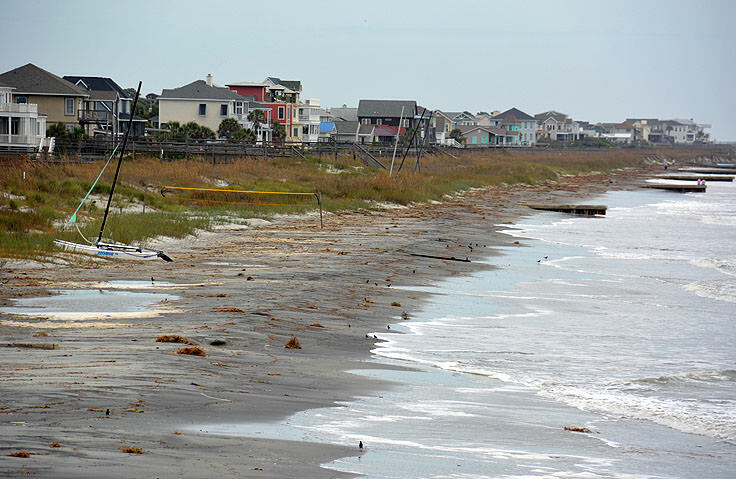 In 1977, the pier burned almost nearly to the ocean floor, (a suspected case orarson), and when category 4 Hurricane Hugo pummeled through the coastal region in 1989, the pier sustained even more damage as winds reached an estimated 135-140 mph along the SC beaches. The pier survived and grew, however, adding a tackle shop, restaurant, and other amenities for the waves of seasonal visitors, and today visitors can easily spend a full afternoon, evening or an entire day at the pier and not want for anything when it comes to entertainment and good old fashioned seaside fun. 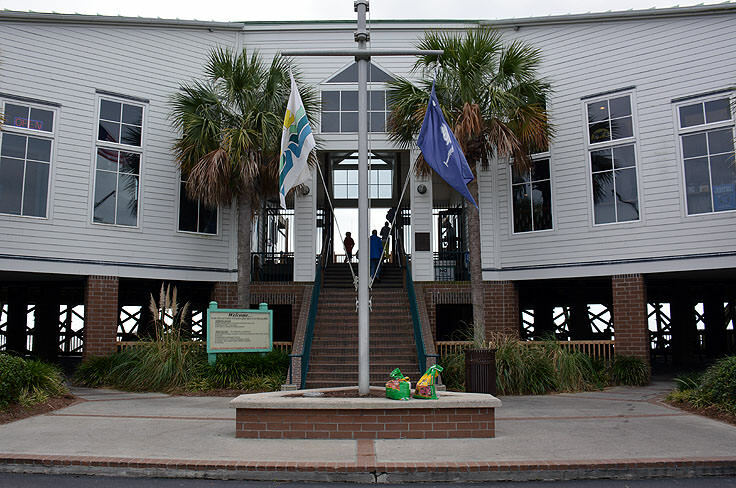 The "pier house," an impressive and sprawling white painted structure bordered with Palmettos, is home to handicapped-accessible restrooms, rod rentals for visitors who don't have a fishing pole handy, and the Gangplank Gift & Tackle Shop, where visitors can pick up authentic souvenirs to take back home. 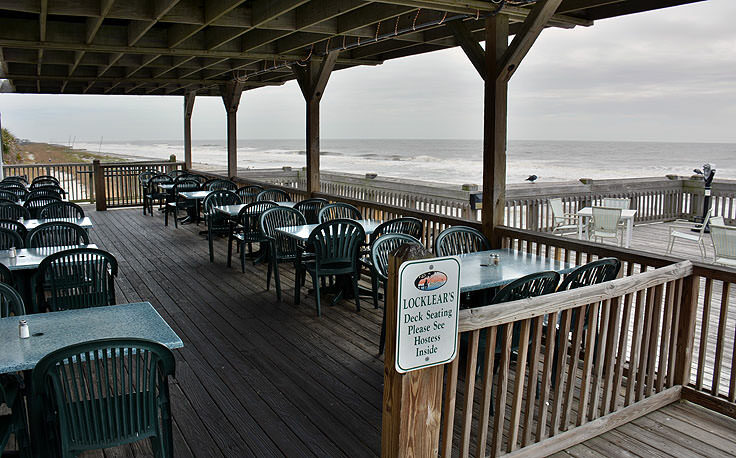 This impressive pier entrance is also home to Locklear's Beach City Grill, a casual joint that features unparalleled oceanfront seating, (complete with complimentary cool sea breezes and shaded tables), and some of the tastiest grub on the beach. Featuring brunch, lunch, and dinner, visitors can saddle in for shrimp and grits, crawfish tails, and even a hearty burger to rejuvenate in between long sessions of casting and reeling along the pier. 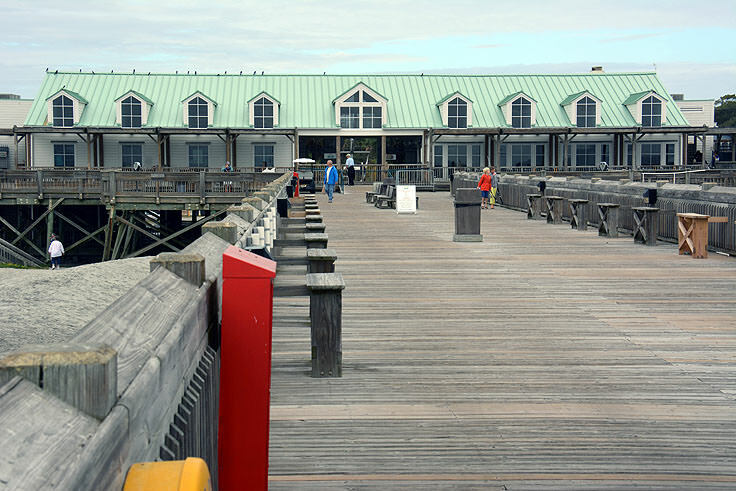 The pier itself has wide wooden railings, several smaller gazebos along the long wooden planks, and an exceptionally spacious shaded gazebo at the pier's end. The end of the pier, which expands into a wide "T" shape, is the place to be for sightseers, who can relax in comfort in the gazebo itself to spot what's biting, or just to admire the ocean waves and endless water views. 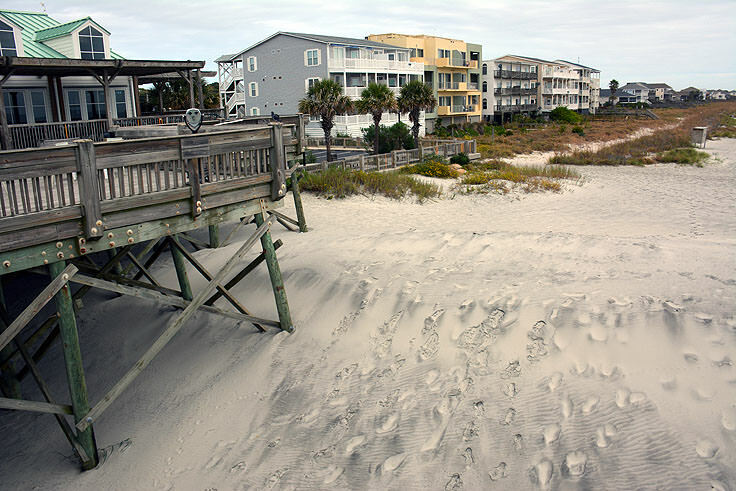 The Folly Beach Pier is very easy to get to, and is located almost directly off of route 171, the main road which leads to the heart of Folly Island. 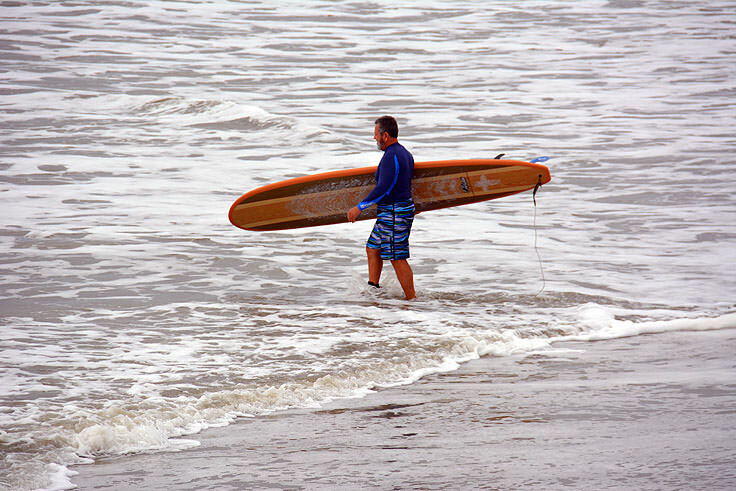 The pier is open year-round, with hours that fluctuate with the season. 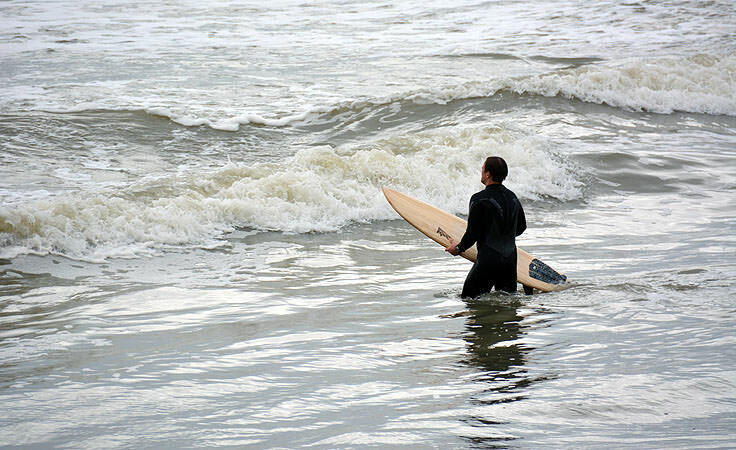 In the December, January and February winter months, the pier is generally open from 8:00 a.m. until sunset. These hours extend as the weather warms up, and in the height of the summer, typically defined as May until September, the pier is open from 6:00 a.m. until 11:00 p.m. There are small fees for the parking areas surrounding the pier, which vary with the season as well, and generally run around $5 in the winter months, $10 in the summer, and around $7 in the shoulder seasons. 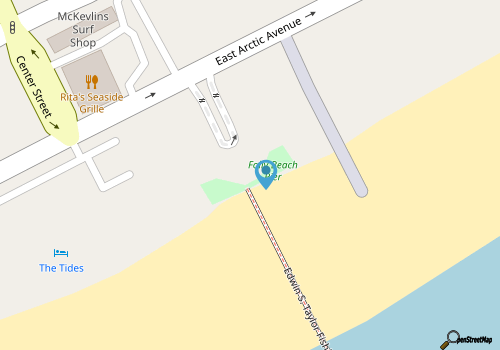 Visitors are free to explore the beaches and the pier house site after parking, and can expect to enjoy a full day at the beach for the nominal parking costs. 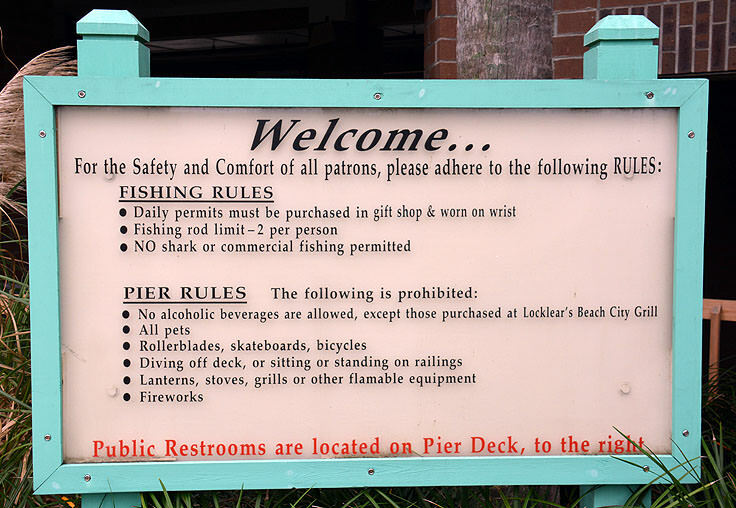 Anglers must pay a pier fishing fee as well, which is generally $8 for visitors, (or $5 for Charleston County residents), $3 for seniors over 60 as well as kids 12 and under, and $4 for groups of 10 people or more. King Mackerel fishing, a very popular and very fruitful pier activity, runs around $10 per person, or $8 for Charleston County residents. Regular anglers can also purchase a seasonal pier pass for multiple trips throughout the year online at http://ccprc.com/index.aspx?NID=31. 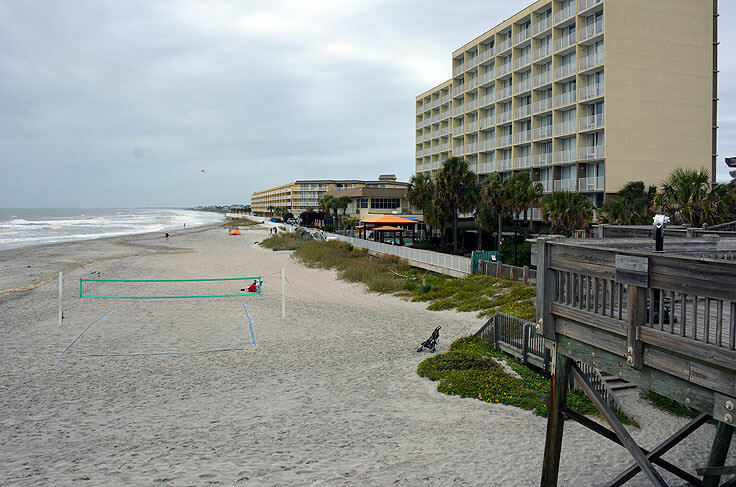 Folly Beach Pier is also home to a wide range of annual fishing tournaments, including the Summer Kick-Off Tournament, the Take a Kid Fishing Day tournament, the Big Kahuna Fishing Tournament, and several general summer and fall "pier tournaments." Prizes are given to the top catches, and interested anglers can check out the annual schedule, tournament fees, and even register for an upcoming tournament or two online at http://www.ccprc.com/index.aspx?NID=1272. All popular events that bring everyone in the community together, even the visiting members, a fishing tournament is the perfect place to test your casting and reeling skills against some of Charleston County's best. The Folly Beach Fishing Pier is a well-loved attraction that stirs up a lot of local pride in coastal Charleston County. An altogether fun destination for world-class pier fishing, beach-going, sightseeing, bird watching, or just strolling and admiring the view, every visitor will have little problem finding a reason to visit this regional landmark. As the second longest pier along the East Coast, Folly Beach Pier has miles of views to offer, including a scenic and gazebo-shaded outlook at the very tip of the long, wooden structure. Bring a camera, a rod and reel, and a loved one to experience this almost other-worldly vista and attraction in the heart of Folly Island.